I'm so in love and I'm SO moving to Scotland! Highland warrior Alexander Macpherson has lost his wife. When he agrees to take Kenna Mackay as his bride to advance his clan's power in the north, he expects a bit of an adjustment. He doesn't expect the sharp-tongued beauty to run away on their wedding night. Still, Alexander wants his runaway bride...and he has the sneaking suspicion that she wants him, too. Although the English king tried to wrest it away, the Highland Targe - ancient relic and protector of Scottish lands - still lies safely in the hands of clan MacAlpin. But for how long? Jeanette MacAlpin trained her entire life to become the next Guardian of the Targe, but that duty has now fallen to her cousin Rowan - a duty Rowan can't seem to master. 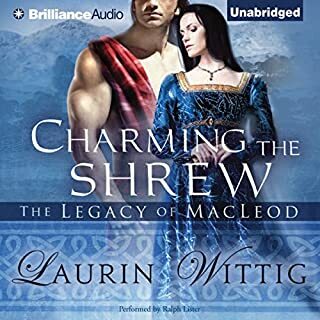 Fearful for her clan's future, Jeanette seeks the solace of a sacred wellspring, and there encounters tawny-skinned Highland warrior Malcolm MacKenzie. Wounded in battle, Malcolm is desperate to regain the use of his sword arm and strikes a deal with Jeanette. In return for her skills as a healer, Malcolm will advise the MacAlpins in their resistance against the English. And when he can once again swing a blade, he'll return to the ranks of the Scottish army to fulfill his duty as a soldier. 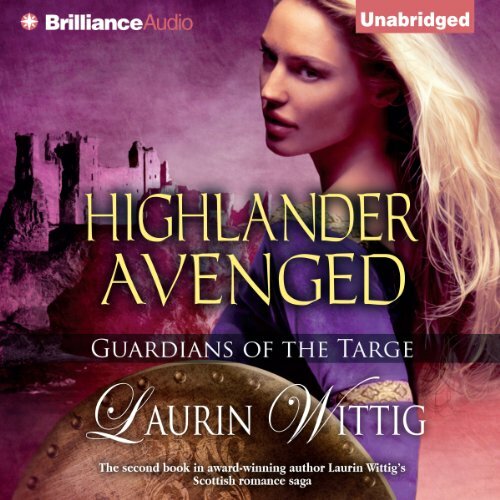 ©2014 Laurin Wittig (P)2014 Brilliance Audio, all rights reserved. This is the second book in the series "Guardians of the Targe". I would not recommend listening to this book if you haven't listened to the first book "Highlander Betrayed". This series is more of a fantasy type highland romance. The "Powers of the Targe" is actually the centerpiece of the series. This book builds on the relationship between cousins Rowan and Jeanette and how they deal with Rowan being the Guardian of the Targe. The story delves deeper into the powers they both possess, the battle with the English, their relationships with the clan and their "protectors" (the men in their lives). I did find it interesting how this series shows women in a more dominant role. The "guardian of the Targe" is in charge of the clan and when she decides to marry, the man has to give up his clan to live with her......interesting concept. Phil Gigante did a wonderful job narrating this romance. This story isn't a deep historical book but more of a light fantasy that you'd listen to on a lazy day. I will be sure to check out book 3 when it becomes available. .
Scotia is a shrew and I can’t stand her. Janette isn’t a ton better. Other than that. A really rest story! Rowan is just so much more likable. The Book shows you what lies will do.Not and outsider. But right a home. What done in the dark comes out in the light. The author does know how to spin a yarn....very nice story with a little bit of history mixed in. 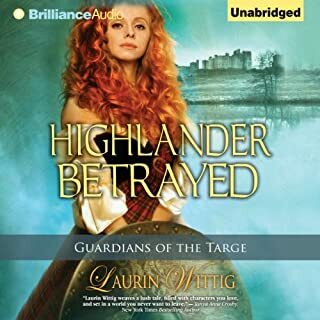 Jeanette MacAlpin trained her whole life to become the next Guardian of the Highland Targe, so when her cousin Rowan is unexpectedly chosen for the honor when her mother is murdered, Jeanette is left not only grieving, but also feeling completely adrift. Compounding her misery, Rowan seems utterly unable to master the skills Jeanette must now teach her to be an effective Guardian for their clan. Their mutual frustration, compounded by fears of an impending repeat attack by the English, lead Rowan and Jeanette to argue over Jeanette's disappointed hopes and dreams for being the clan's Guardian. 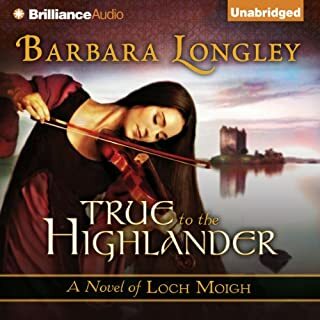 She leaves the castle in a huff and stumbles upon Malcolm MacKenzie, an injured warrior and heir to clan MacKenzie, desperately trying to heal his sword arm. He and Jeanette strike a bargain: Jeanette will use her healing skills to rehabilitate his sword arm in exchange for his lending his skills in battling the English as an advisor to the MacAlpins until he is well enough to return to Robert the Bruce's army. But as Jeanette heals his arm, he heals her wounded heart and passion simmers between them. When Rowan has already been chosen as Guardian, why would Jeanette be developing any gifts now? What does that mean for her role in clan MacAlpin? 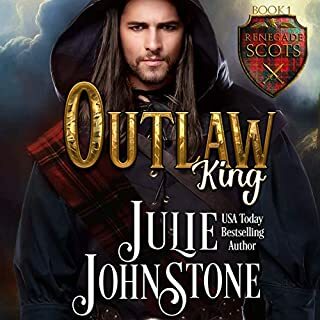 When his arm heals, will Malcom forsake his duties as a soldier to Robert the Bruce and as heir to the lairs of clan MacKenzie or is his love for Jeanette strong enough to compel him to stay? Does Jeanette have a significant enough role to compel her to stay with clan MacAlpin, or will her love for Malcolm give her a new purpose and direction in life? This sequel to Highlander Betrayed delivered all I expected from the series in terms of action and suspense. The author does a good job depicting the enmity between the Scots and the English, as well as the perfidy of some Scots clans that chose to fight on the English side. The use of magic requires a little too much suspension of belief for my taste (seems like to an even greater degree than in book 1 in this series), but since this is listed under the "paranormal" genre, and the Highlands are full of stories about magic and the fae, I suppose I can't argue too much. I listened to this book on audible, and as is always the case with Phil Gigante, the performance was excellent. His deep, resonant voice is particularly suited to Scottish warriors! The continuing story in the trilogy Guardians of the Targe, is exciting but also heart warming. I highly recommend it. Good story. Excellent narrator. Phil Gigante is my all time favorite narrator. Poor narrators can break a good book. Mr Gigante bring them alive for me. Please narrate more. What did you love best about Highlander Avenged? This was a wonderful book. I couldn't get enough listening to it. I had every emotion that can be had. I even got chills when Jennet was reviled she was a seer. I loved it.